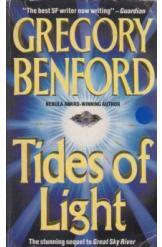 Tides of Light by Gregory Benford Sci Fi, book in a good condition all pages intact. The author has won the Nebula award. This book is the sequel to Great Sky River. In this book a band of humans flee aboard a regenerated starship to another planet where the mechs are in retreat and threatened by intelligent and and powerful alien cyborgs.